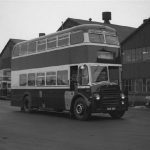 PD2A/30 fitted with Metro-Cammell high-bridge rear entrance lightweight body seating 64 passengers. Delivered new to Cardiff Corporation, one of five identical vehicles in the batch 367-371. 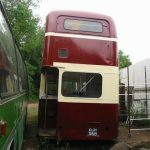 Known to the crews as ‘Skinny Leylands’ due to the narrow width of the upper saloon, which conductors, hated. 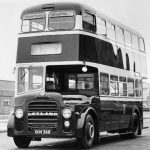 These were the first Leyland double deck buses purchased since a batch of Leyland Titan TD4c’s which arrived in 1936. 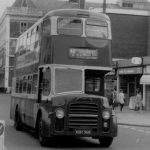 Cardiff, had standarddised on AEC since the mid 1930’s, and on Daimler and Guy chassis’ during the post war period.The PD2A/30’s introduced the well known Cardiff translucent centre roof panels, running continuously between the roof domes, also on two of the batch, 367 and 370 florescent lighting was introduced, this was later adopted as standard for all deliveries from 1962. 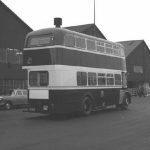 Other features included a one piece upper deck rear emergency door window which at that time was rare indeed in the Cardiff fleet, only three Crossleys with rare Scottish Commercial bodies, new in 1947/8 had this feature. Last but not least, these vehicles heralded the revised rear destination display, using the service number only, which from then on became the standard until 1974 when rear destination indicators of any sort were abandoned until the trail fitting of two types of electrically operated rear service number displays, fitted to Daimler Fleetlines 555 and 559 respectively.These vehicles had a comparatively short working life of only 10 years. Our example being acquired by Kenfig Motors along with stable mate 371 during the early 1970’s. 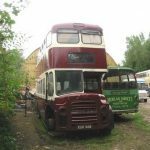 Later moving to a PSV driving school and used by them until around 1989 when it was sold for scrap. 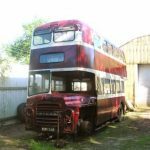 Brought back to Cardiff from a Hull based dealer it then resided for some years at the Newport Transport Depot, moving again to another location in Newport before arriving at our present site near Cardiff. 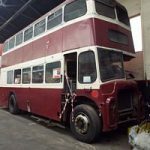 This bus was subsequently moved to our new premises, the Bus Depot Barry by December 2008.